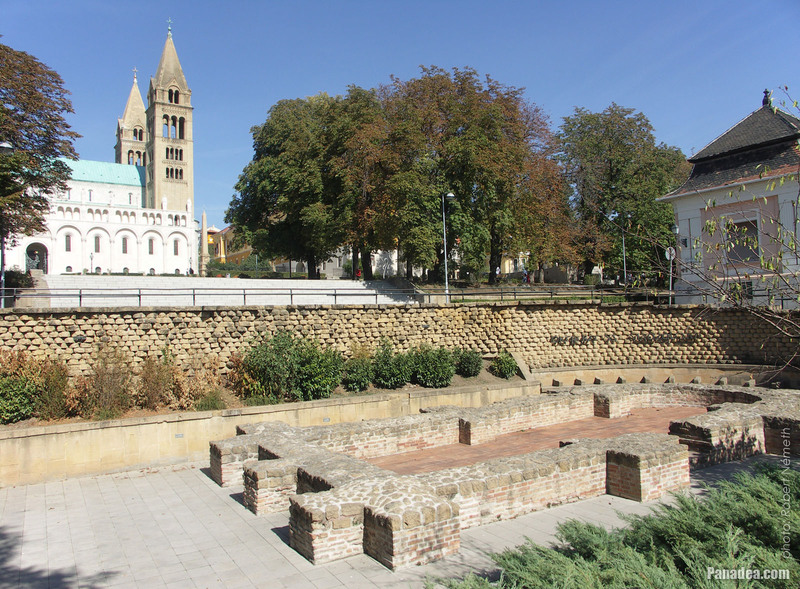 The tomb of Janus Pannonius Hungarian poet and bishop can be found on the left edge of the picture. 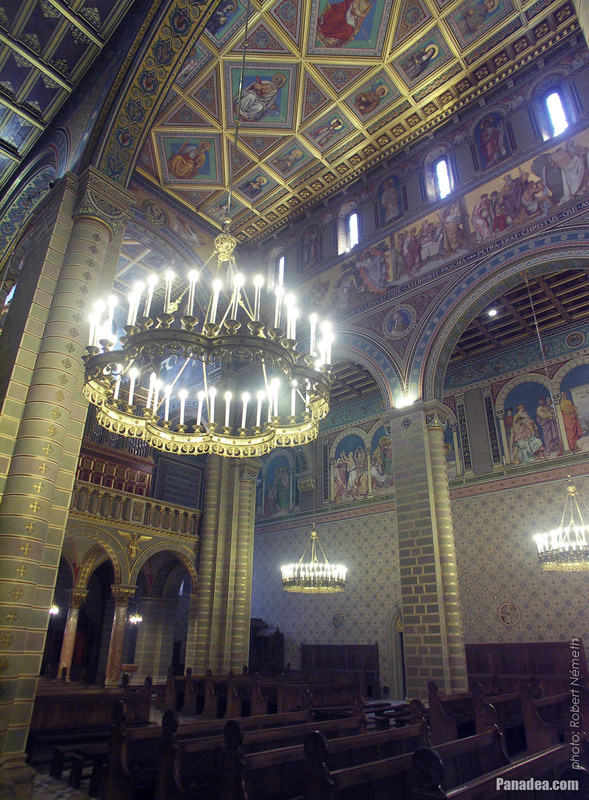 The instrument was constructed in 1887, renovated and modernized in 2008. 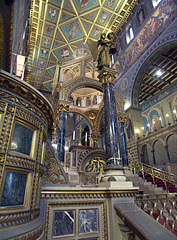 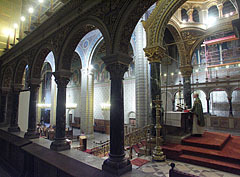 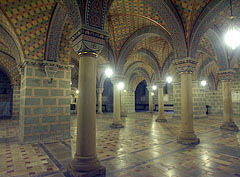 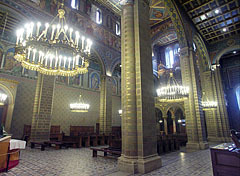 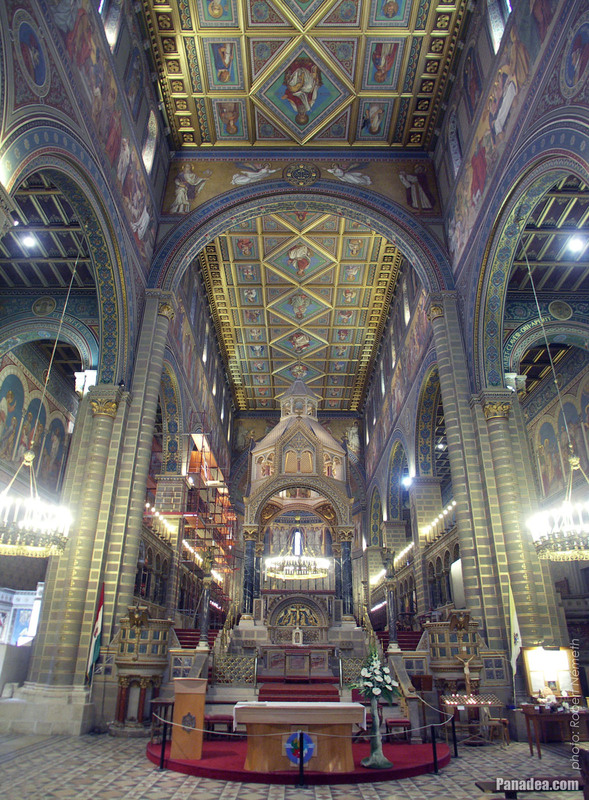 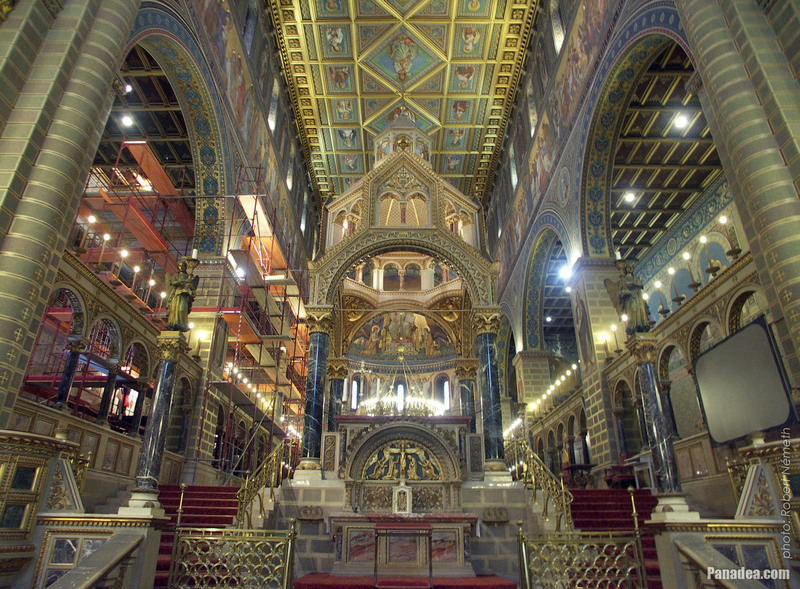 Interior of the Cathedral and Basilica of Pécs, with the so-called "triumphal Arch"
This separates the sanctuary from the nave. 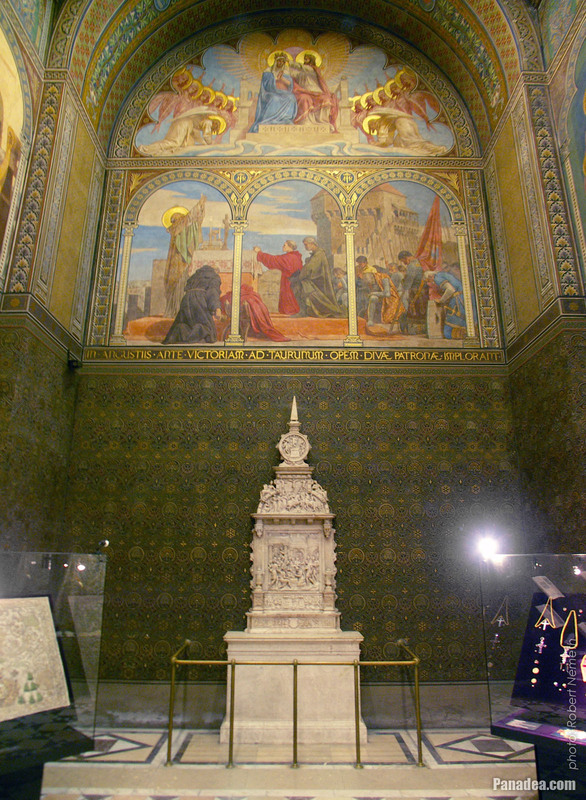 The alabaster epitaph altar from the 17th century Rome, and above it there's a picture from Bertalan Székely: "St. Maurus Bishop of Pécs presents a sacrifice"
The replica was created by György Zala in 1889. 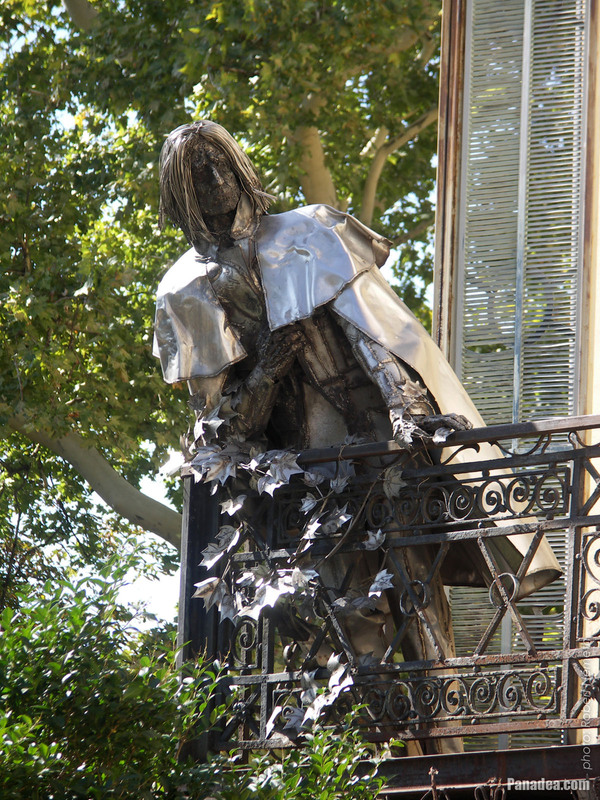 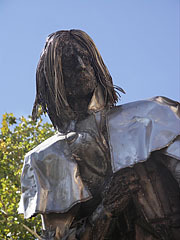 It was made of chrome steel metal sheets, created by Imre Varga in 1983. 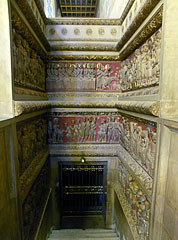 The obelisks were brought here from the nearby Budafa stone pit. 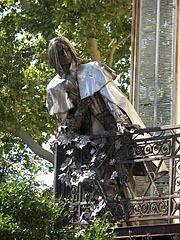 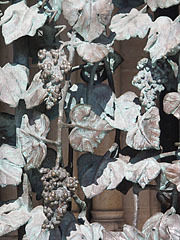 It was made of bronze by Sándor Rétfalvi in 2000. 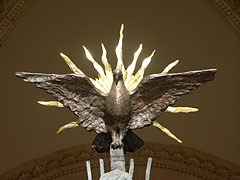 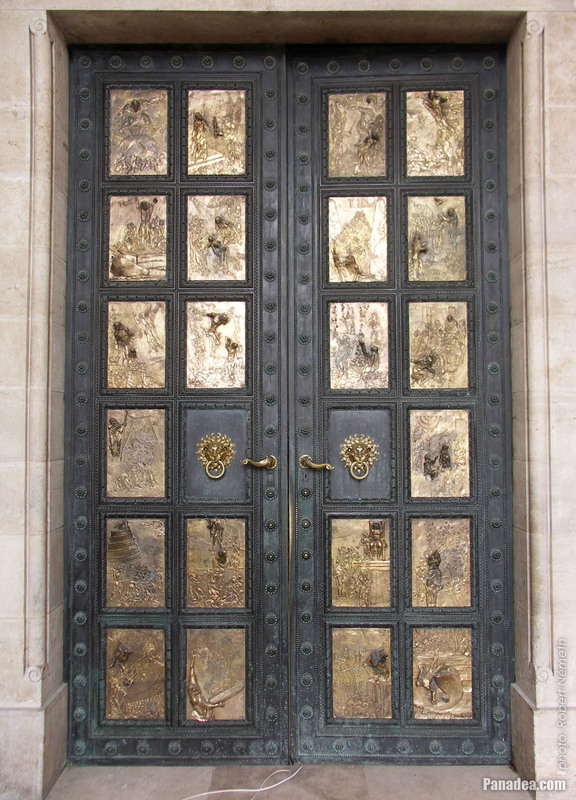 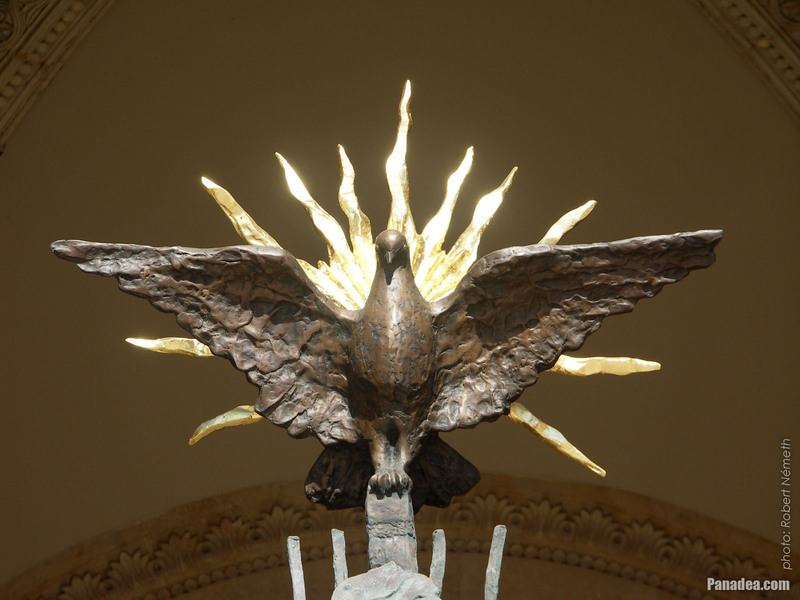 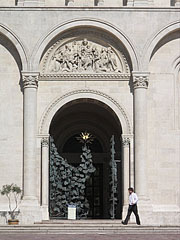 The bronze dove figure on the Millenium Gate symbolizes the "outpouring of the Holy Spirit"
Created by Sándor Rétfalvi sculptor from Pécs in 2000. 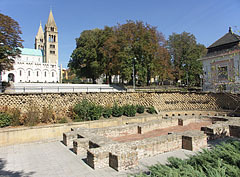 The statue was removed from here due to restoration and one year later it was placed back to here. 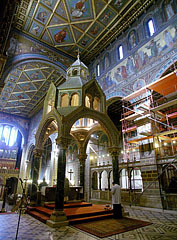 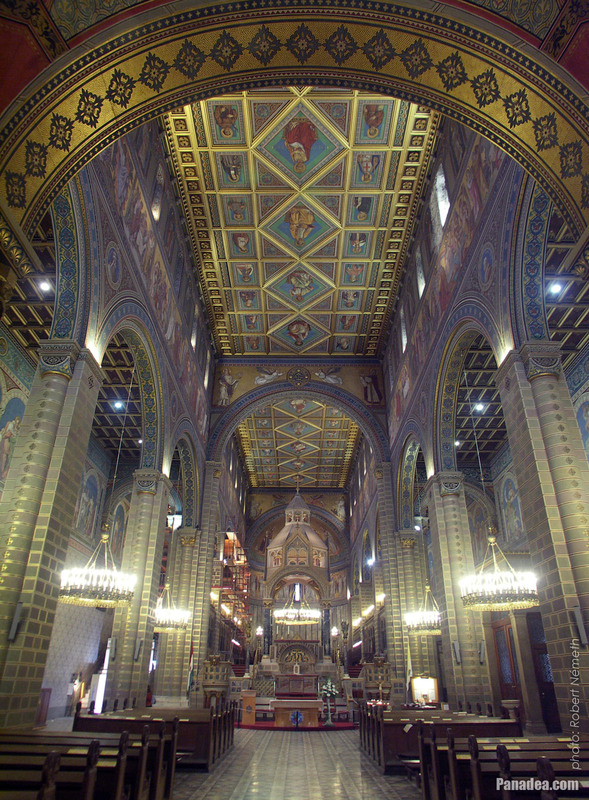 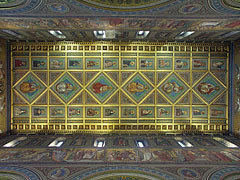 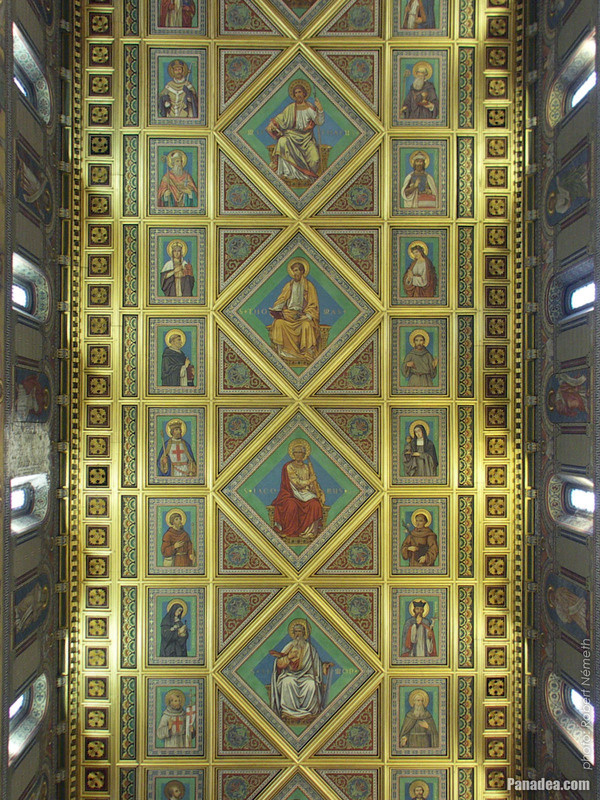 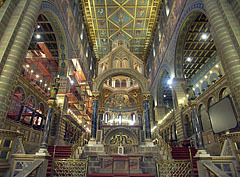 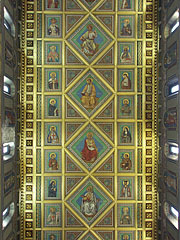 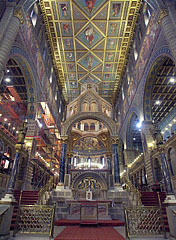 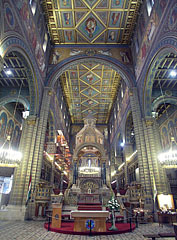 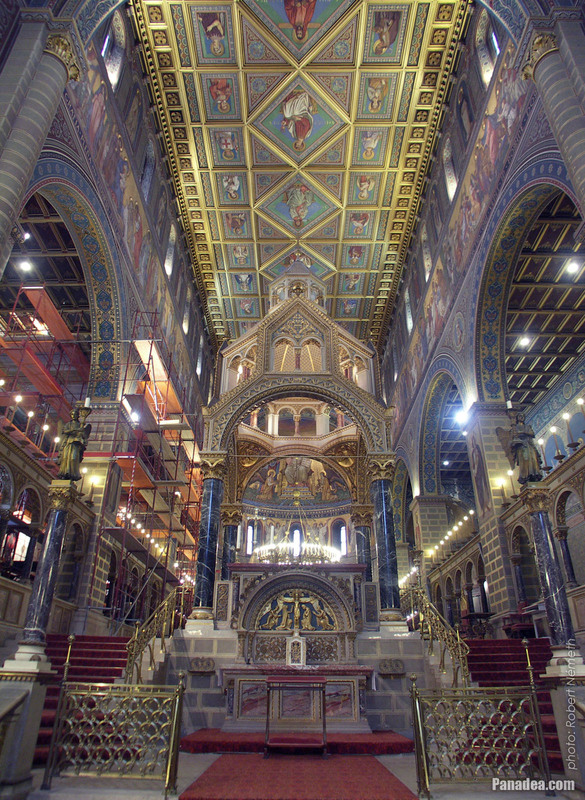 The covered canopy structure which is standing on columns and appears in the sanctuary of some catholic churches is the so-called "ciborium" (from the Greek word "ciborion"). 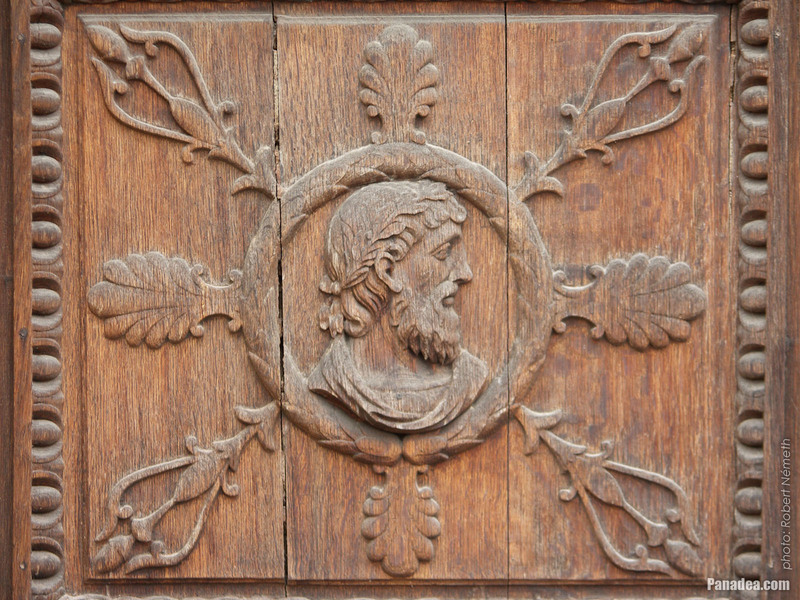 Its origin dates back to the ancient Romans, who wanted to highlight the important or privileged places with this solution. 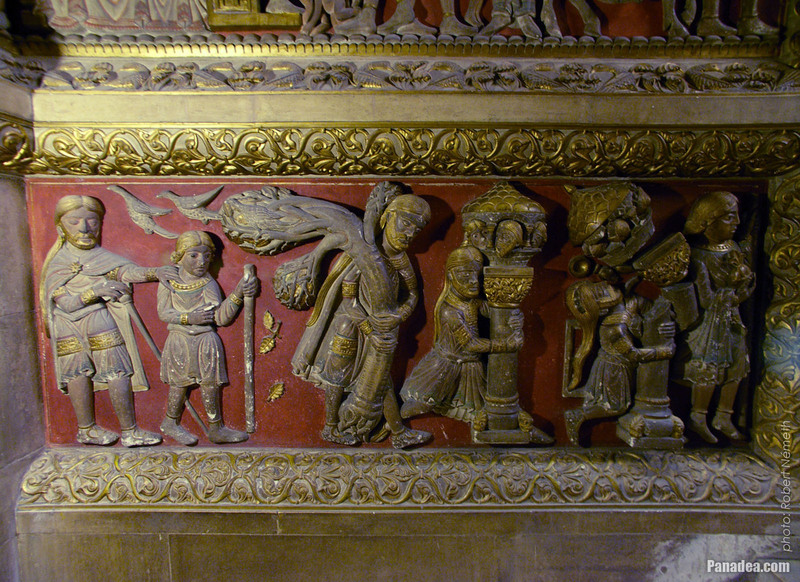 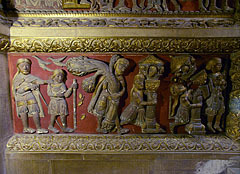 At that time a stone of wooden canopy was usually belonged to it. 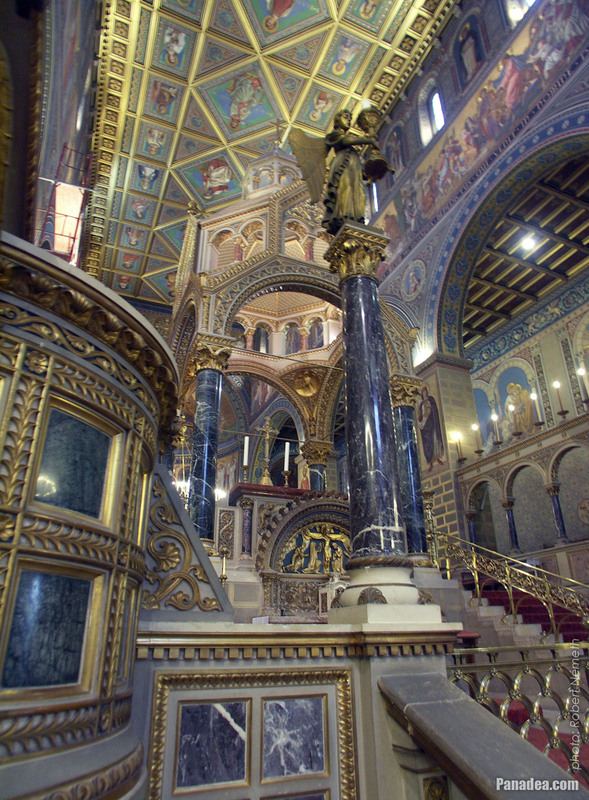 Today the most beautiful ciborium is located in the St. Peter's Basilica in Rome, that one was created by Giovanni Lorenzo Bernini in 1633. 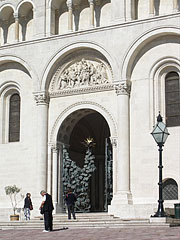 There's another example in the San Pietro in Vincoli ("Saint Peter in Chains") minor basilica, also in Rome, Italy. 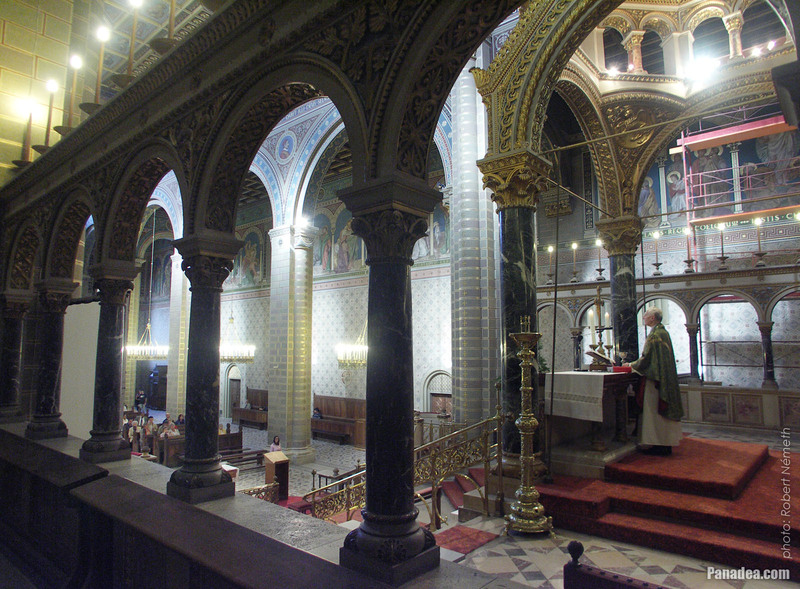 In the modern times church architecture the ciborium is very rarely used, so the Cathedral of Pécs is very special in this regard, because there is one such structure within its sanctury. 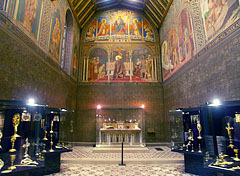 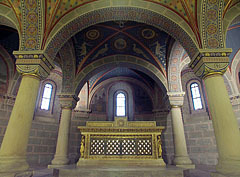 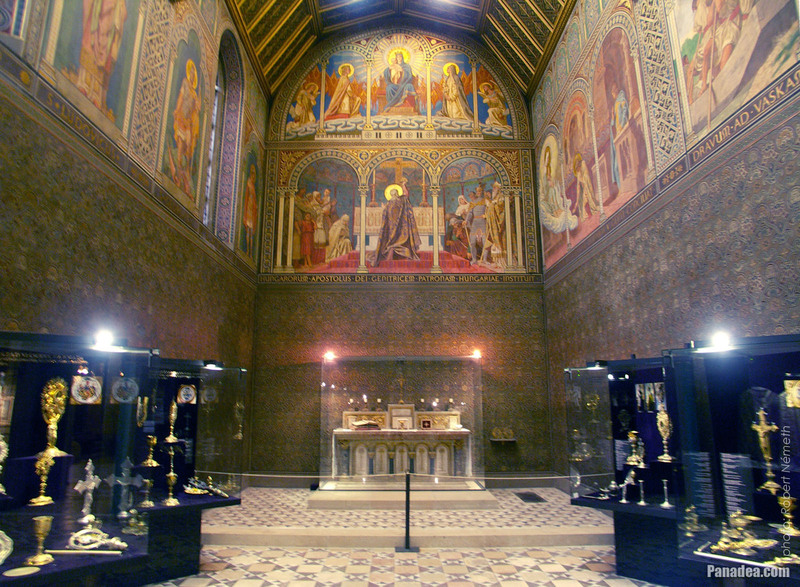 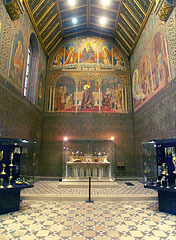 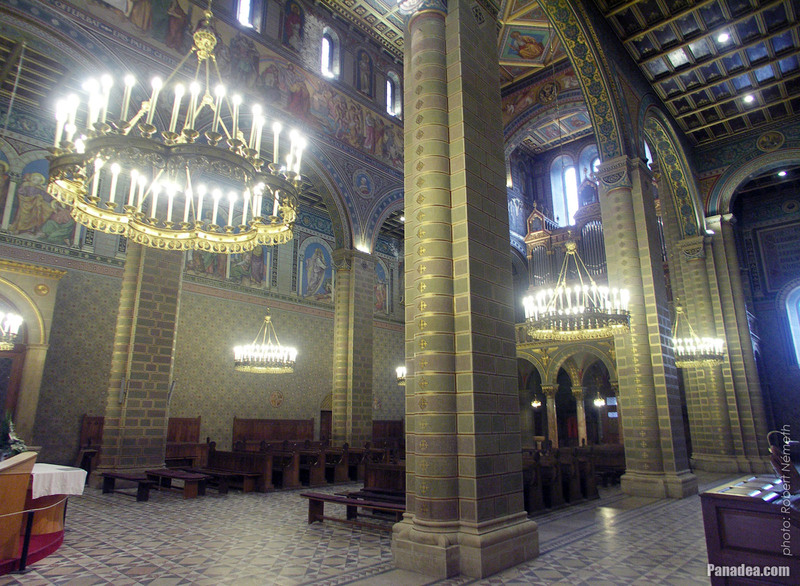 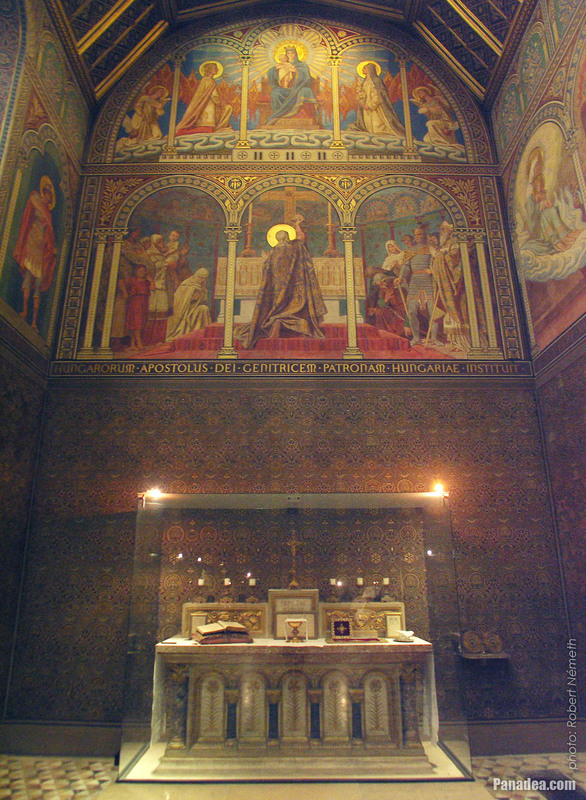 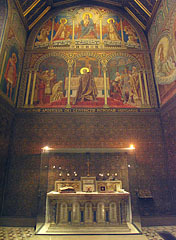 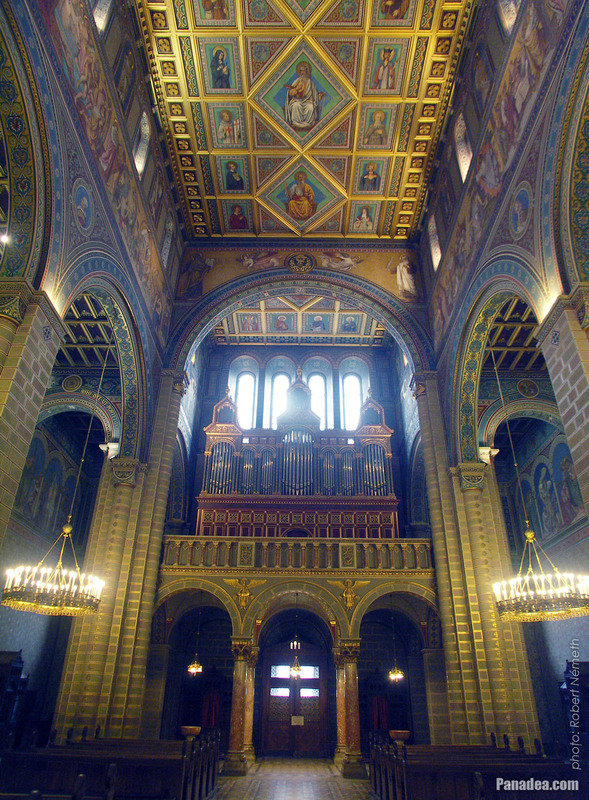 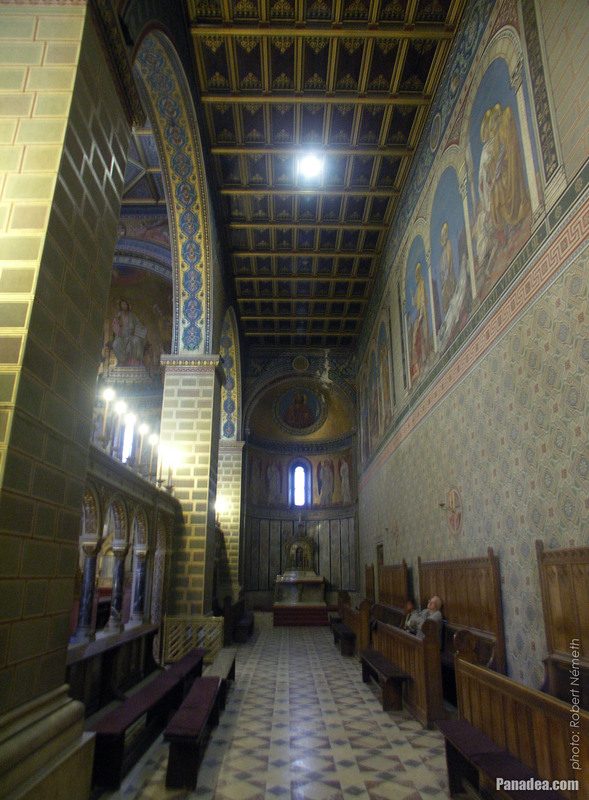 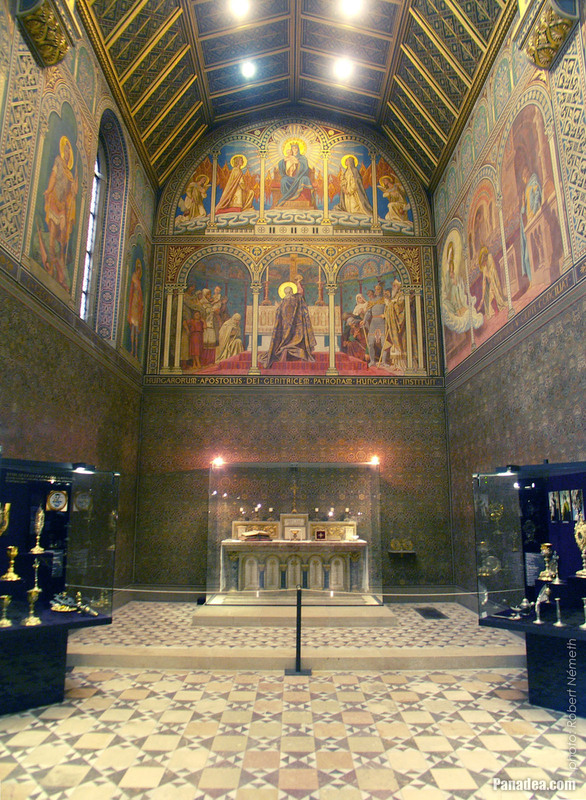 This is the so-called "Canopied People's Altar" or "Ciborium People's Altar", created by György Zala at the end of the 19th century, so it is relatively new (although there was a similar structure in the sanctuary of the original Romanesque church). 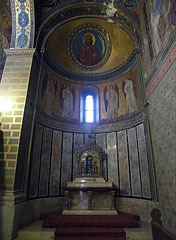 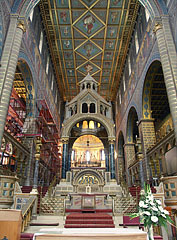 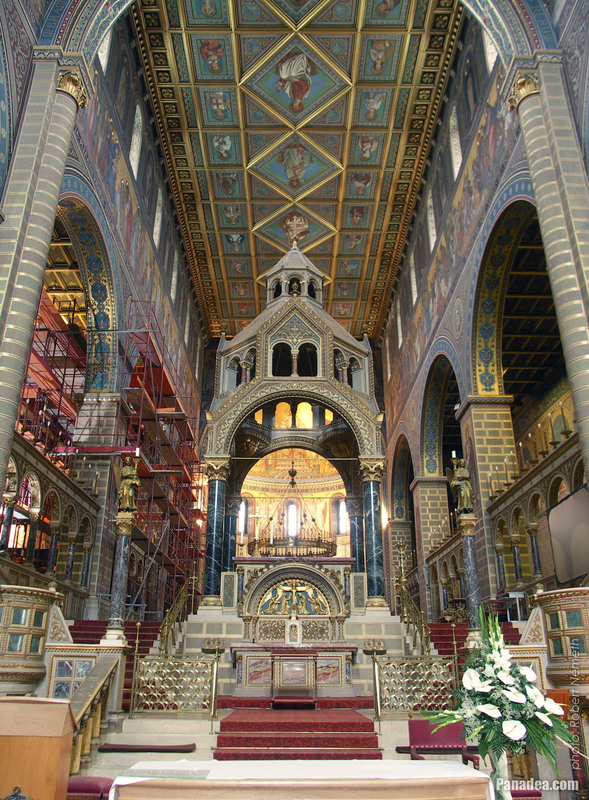 The People's Altar was needed because the high altar (or main altar) cannot be seen from the nave (the floor of the sanctuary should be raised due to the crypt). 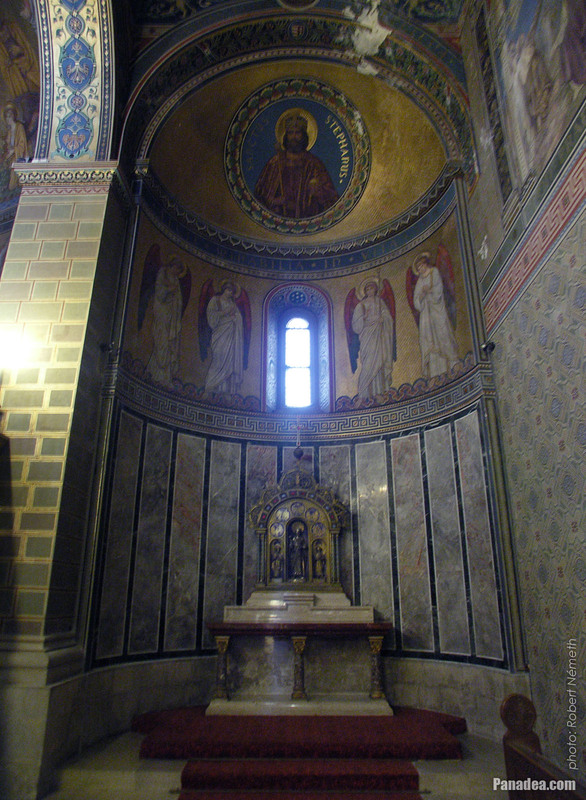 by the way, the ciborium word has another meaning as well, which is also related to the church: a drinking cup or chalice-like closable covered vessel, which is an accessory of the liturgy (religious ceremony) of the Catholic and the Anglican Church and used to store the communion wafer (in other words the "sacramental bread"). 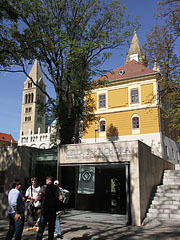 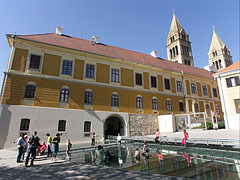 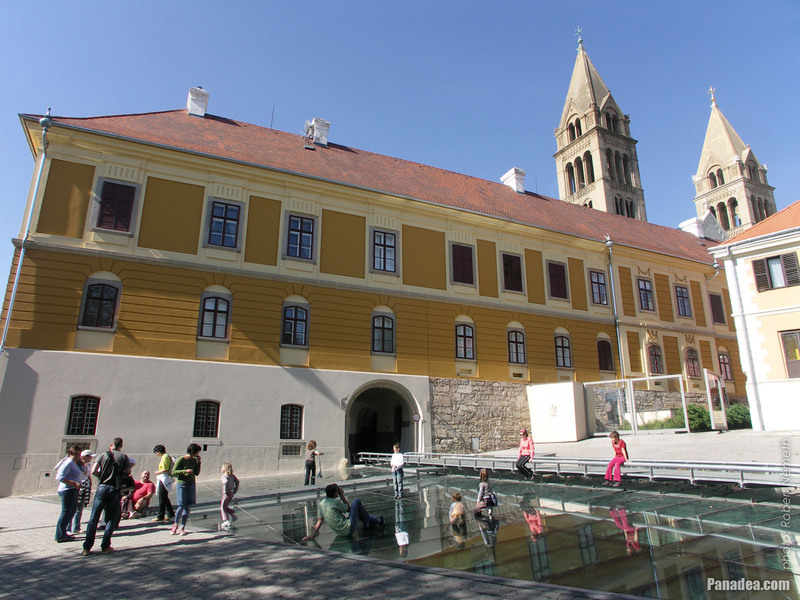 The Cathedral of Pécs was the first church in Hungary that received air conditioning to prevent the restored works of art and the furnishings from the deterioration. 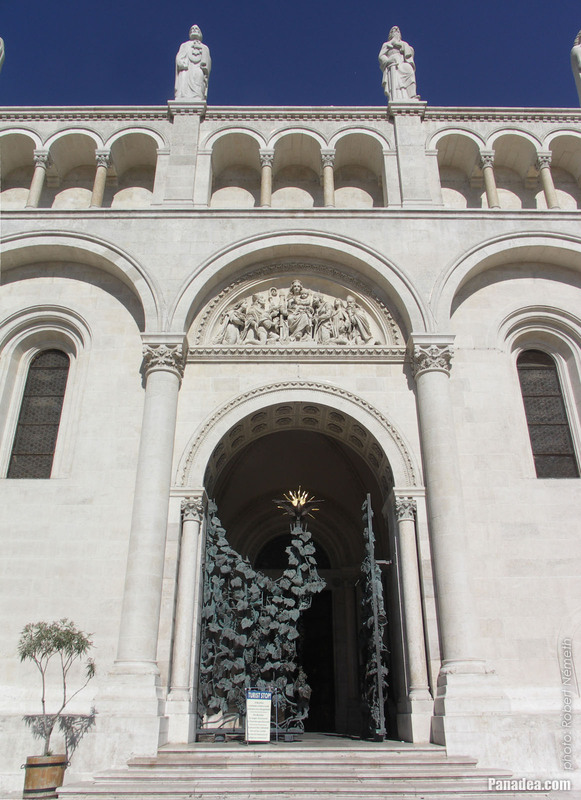 Europe's (and maybe the world's) biggest alabaster sculpture is kept within the St. Mary's side-chapel in the Cathedral of Pécs. The alabaster epitaph altar was created in the 16th or 17th century and initially intended to be a tombstone, probably a work of an unknown Dutch master (some sources suggest that it was created in the workshop of Cornelius Floris for a rich Medici). 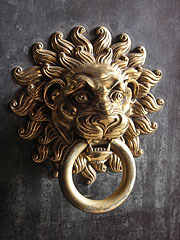 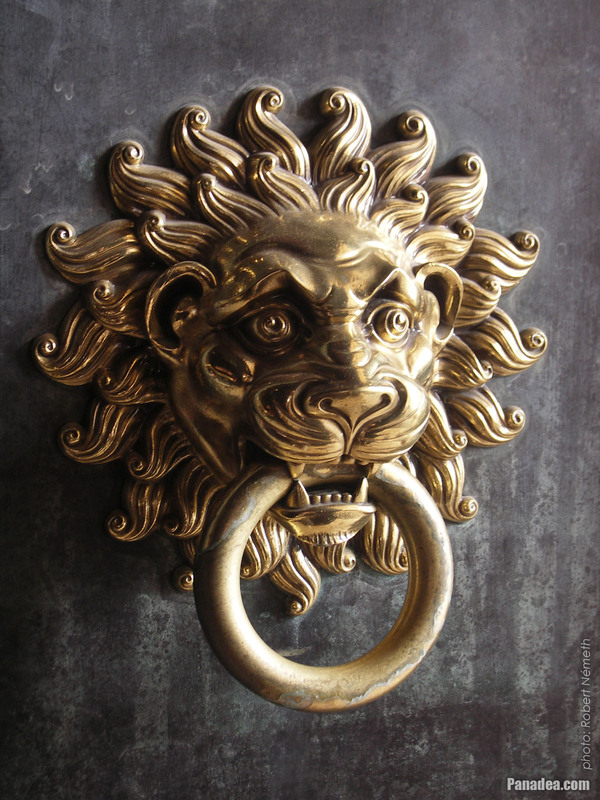 It was made during about 20 years, because the soft material couldn't be carved, just furbished and polished. 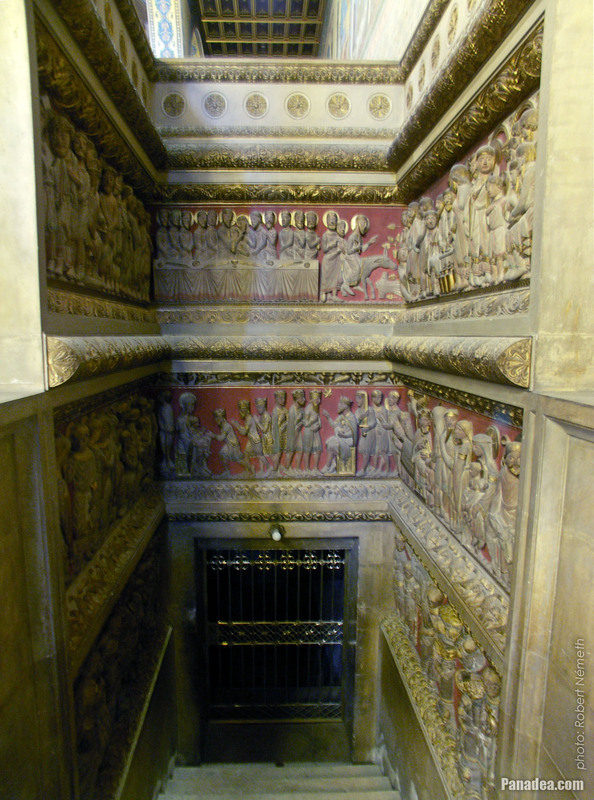 However, using this method it was also possible to finish even more finer details, for example the facial expressions of the human figures, which is very unusual concerning the alabaster sculptures. 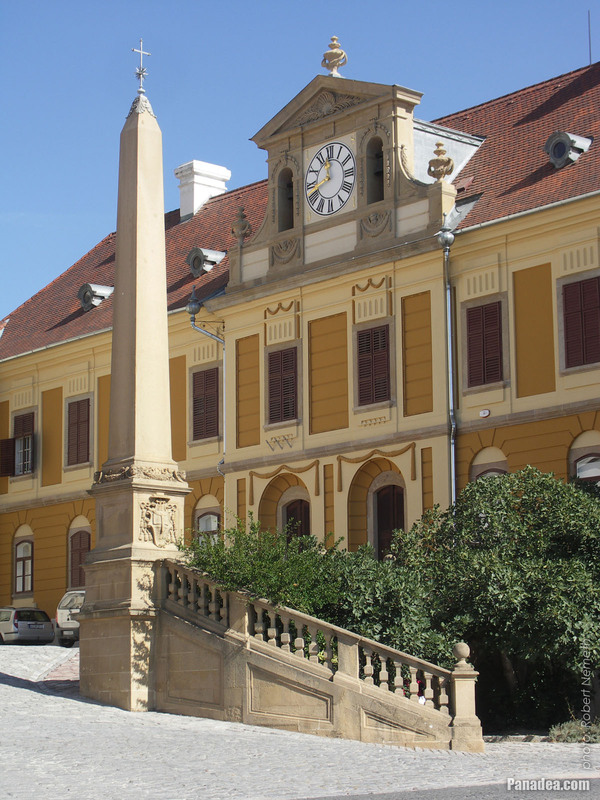 It was arrived to Hungary in courtesy of László Esterházy bishop of Pécs, who brought from Rome to Pécs in 1787 and paid a tremendous amount for it (it is another matter how could he have such a lot of money). 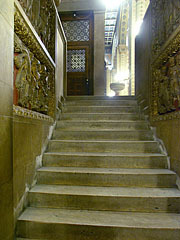 The alabaster is a fine-grained gypsum rock. 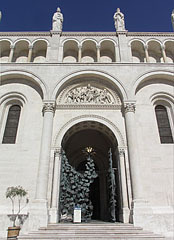 The sculpture that is made of it became somewhat transparent when illuminated with bright light. 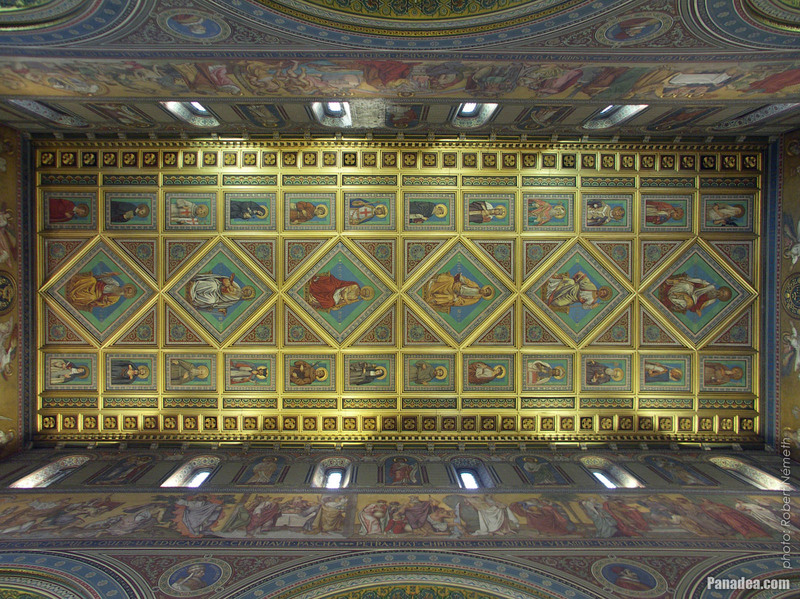 It has more color variations, but the white is the most precious anyway. 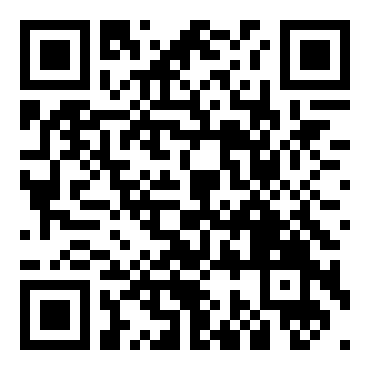 It is hard and time-consuming to work with it, to furbish and polish it. The Ancient Greek and Latin-derived word "epitaph" means "funeral oration" or "grave inscription". 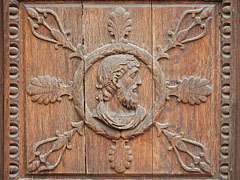 Nowadays it is often used for a framed inscribed picture, plaque or relief in a church or chapel, with inscription in memory of the dead. In 1991 during the renovation of the Pécs Cathedral bones were found, and these already then seemed to be the mortal remains of the Hungarian humanist poet and bishop Janus Pannonius (1434-1472). 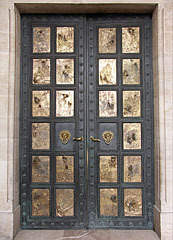 The anthropological investigations of 2008 confirmed it. Finally the body of Janus Pannonius was buried in the lower church (crypt) of the basilica, his final resting place is now situated on the western wall near the grave of bishop Nándor Dulánszky. 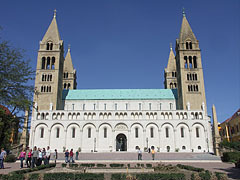 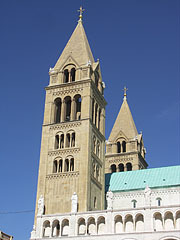 The Cathedral Basilica of St. Peter and St. Paul in Pécs reached its current form after the modifications between 1882-1891. 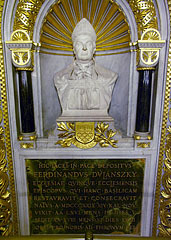 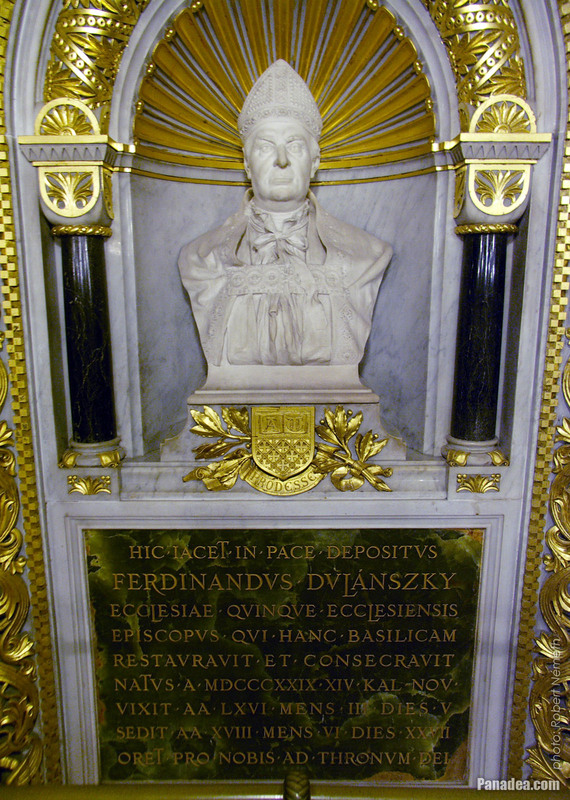 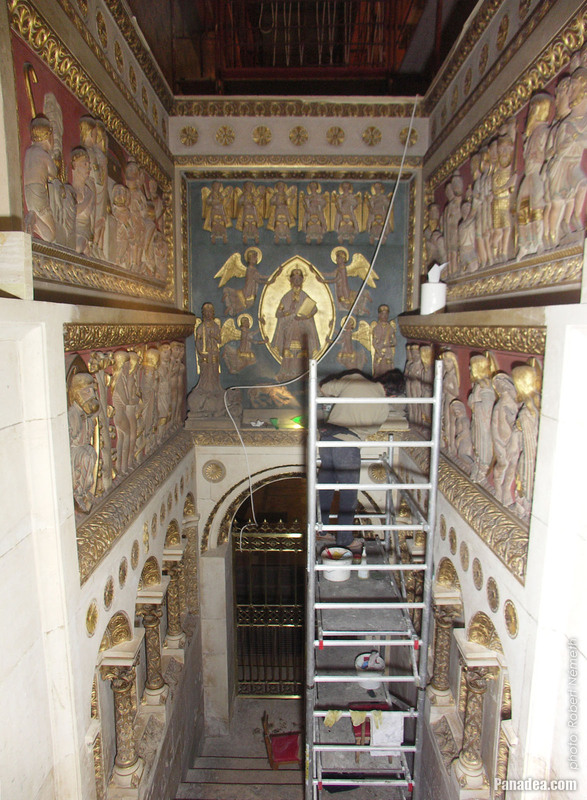 The reconstruction was ordered in 1877 on behalf of the Church by bishop Nándor Dulánszky, whose tomb and bust is located in the crypt of the cathedral. 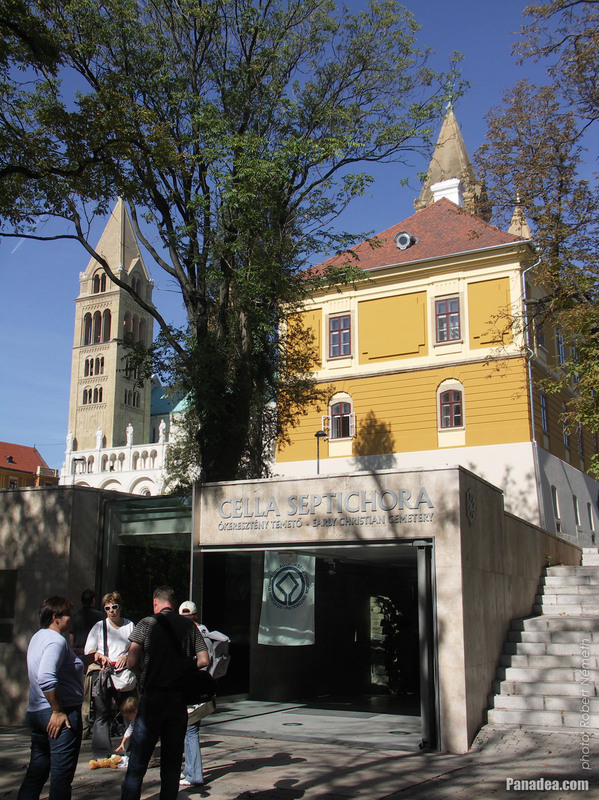 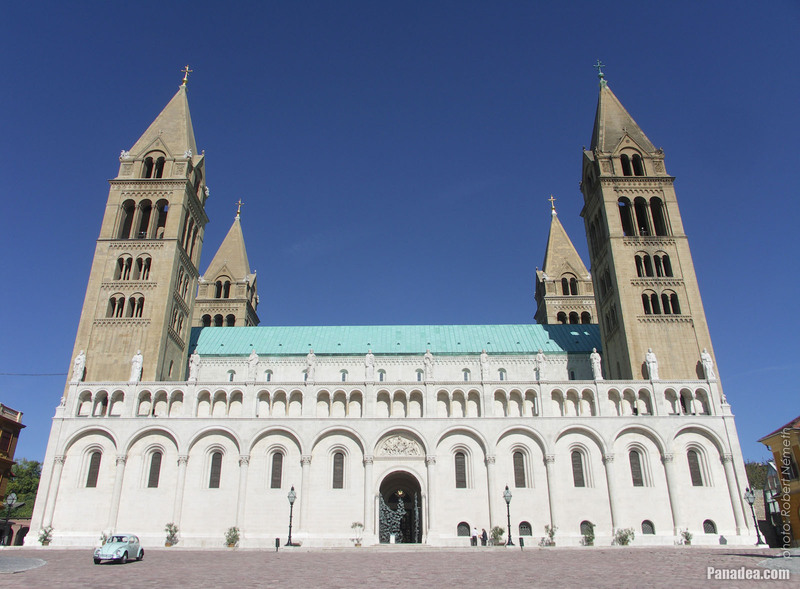 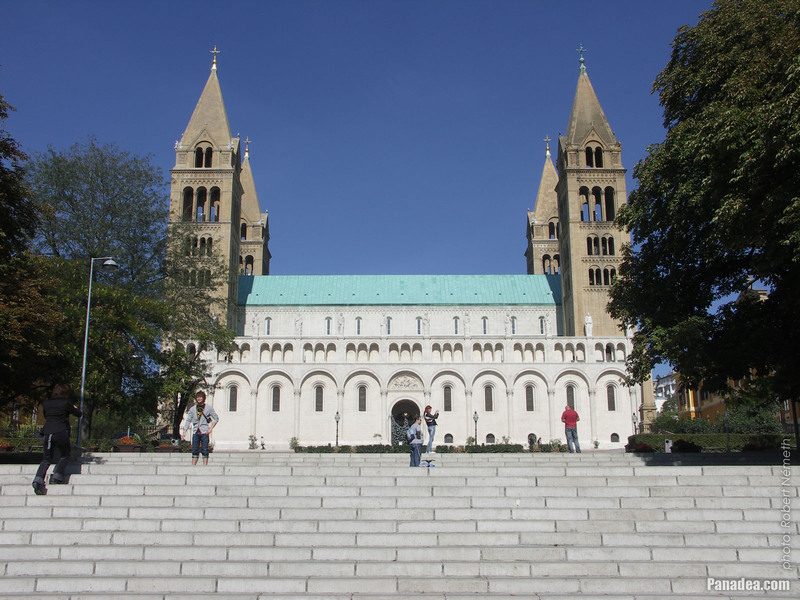 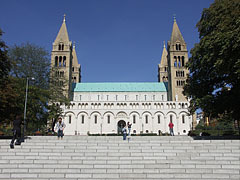 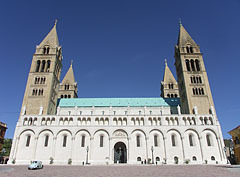 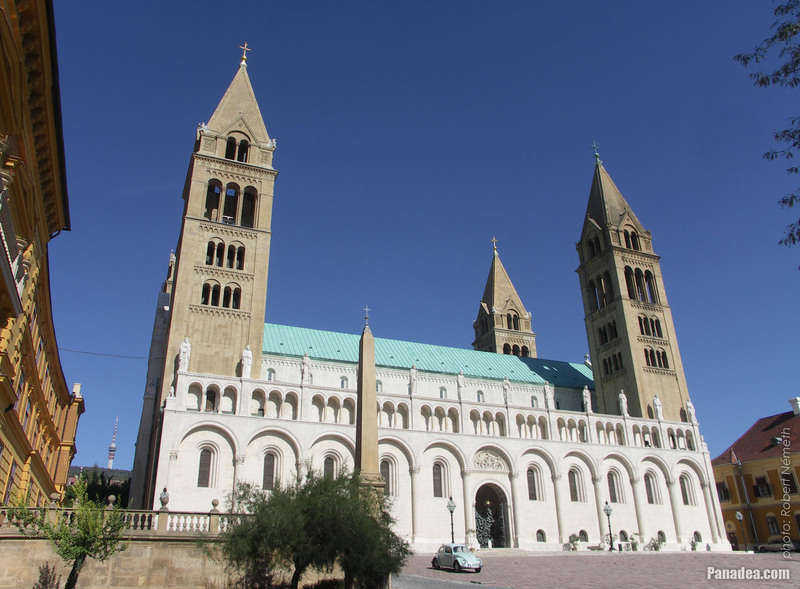 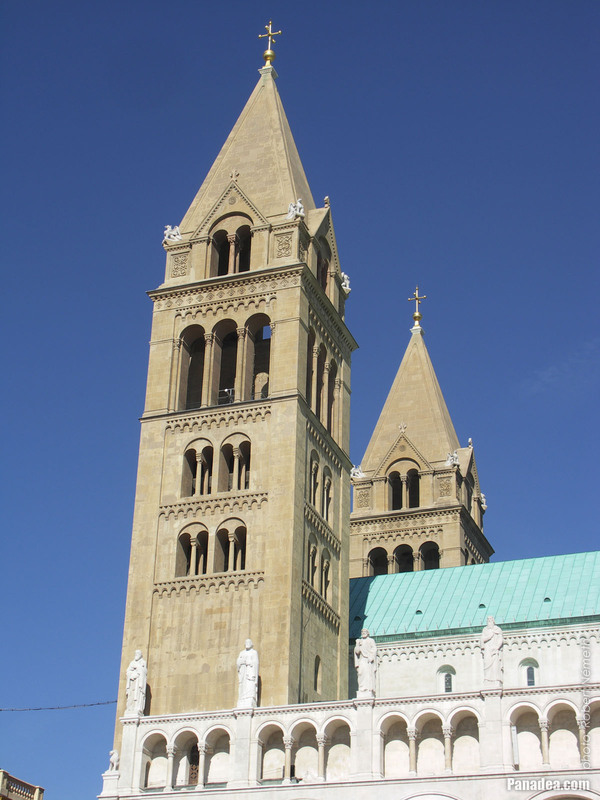 The alteration works were led by the Austrian architect Friedrich von Schmidt, the primary objective was to restore the original Romanesque character of the church, as it was in the age of the Árpád dinasty in the 11th century. 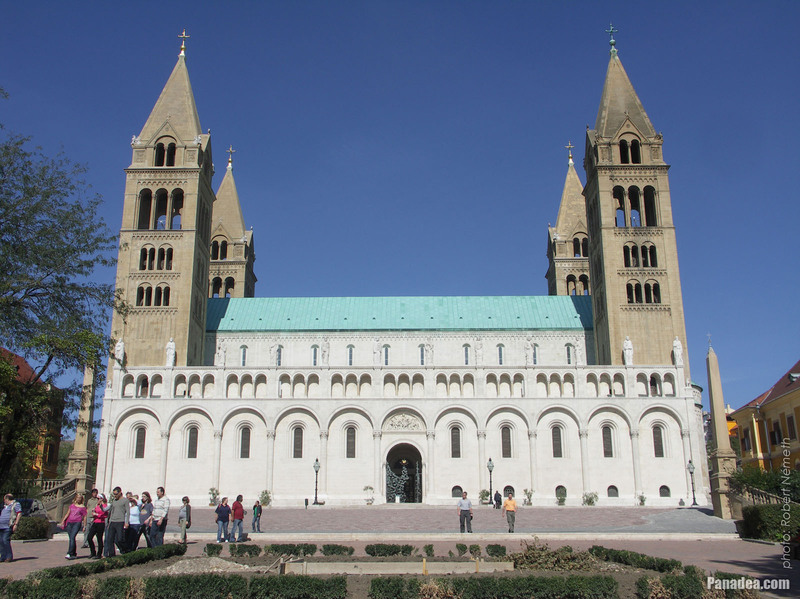 However, in the meantime unfortunately a lot of such values were dismantled or sold that were built in earlier but did not fit into the Romanesque style. These were mostly baroque fixtures and furnishings. Fortunately some of them were placed into the surrounding parish churches, these ones still can be seen today. 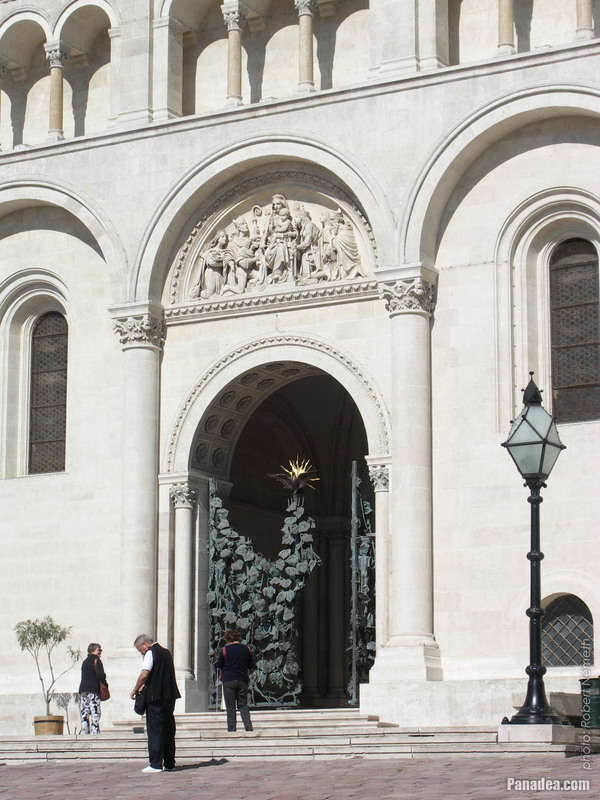 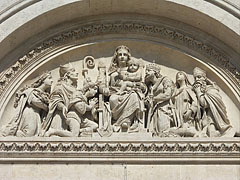 There are statues of the Apostles over the southern facade of the Cathedral Basilica of Pécs. 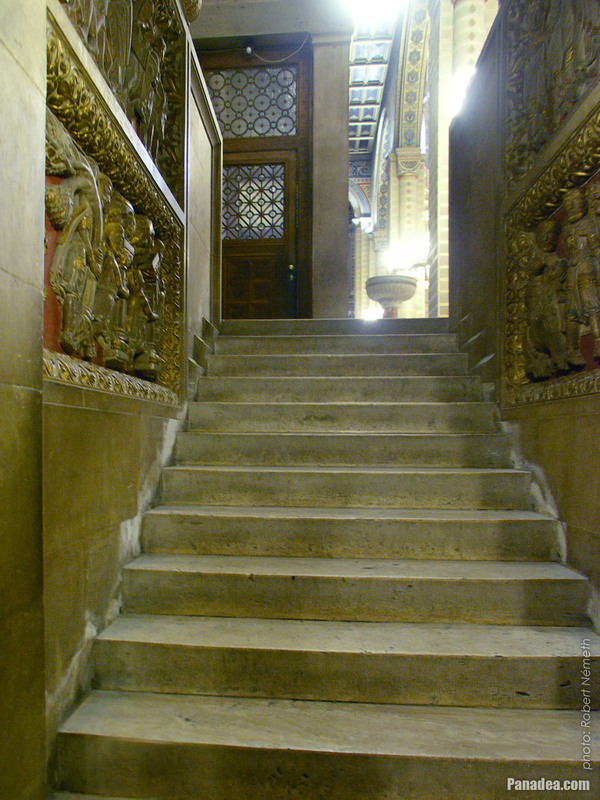 Although they may look old, but in reality they are not. 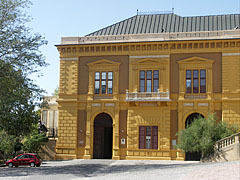 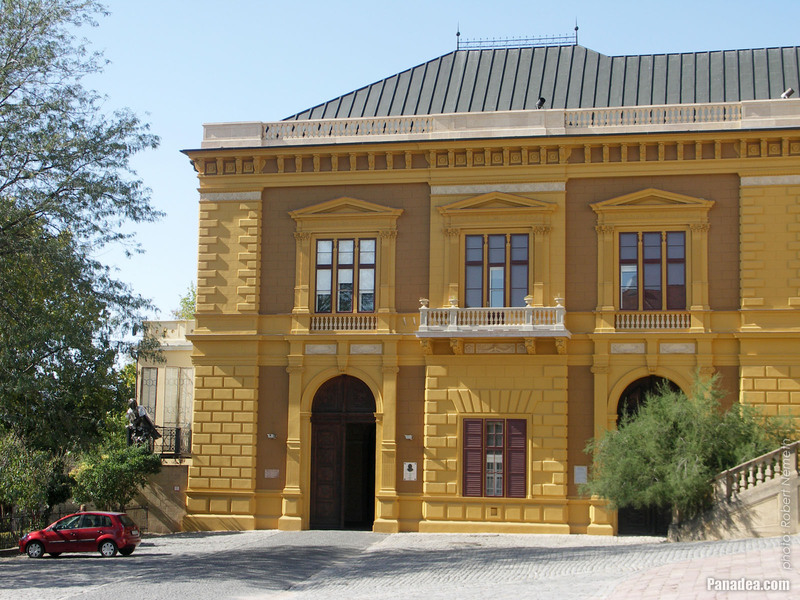 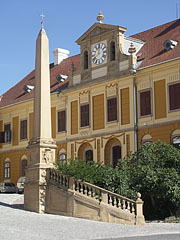 The original statues were created in 1854, these ones still can be seen in the yard of the Episcopal Theological College of Pécs (in Hungarian "Pécsi Püspöki Hittudományi Főiskola") an 1 Papnövelde utca (street). 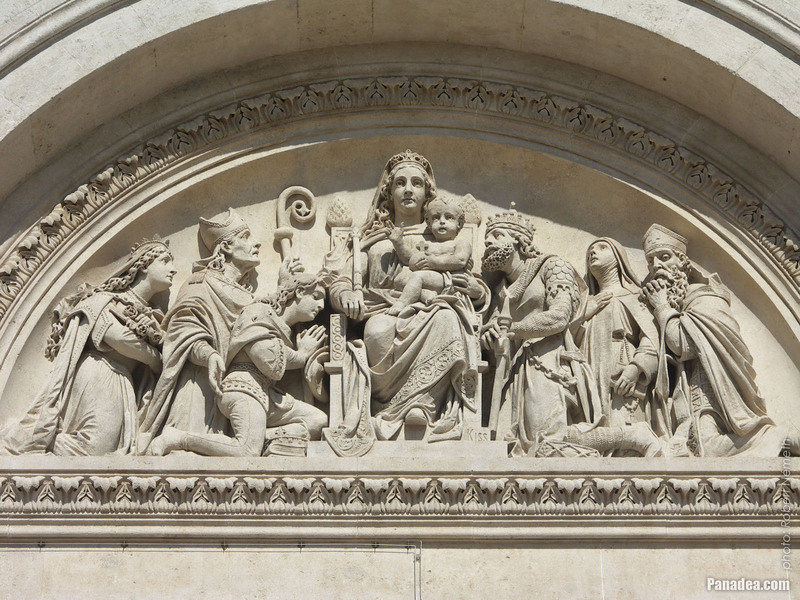 Then in 1891 another apostle statue series was created, but due to the used poor quality sandstone (like initially in case of the Hungarian Parliament Building in Budapest) they became ruined soon. 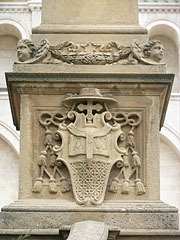 Only two of them survived, these are standing in the garden of the Bishop's Palace. 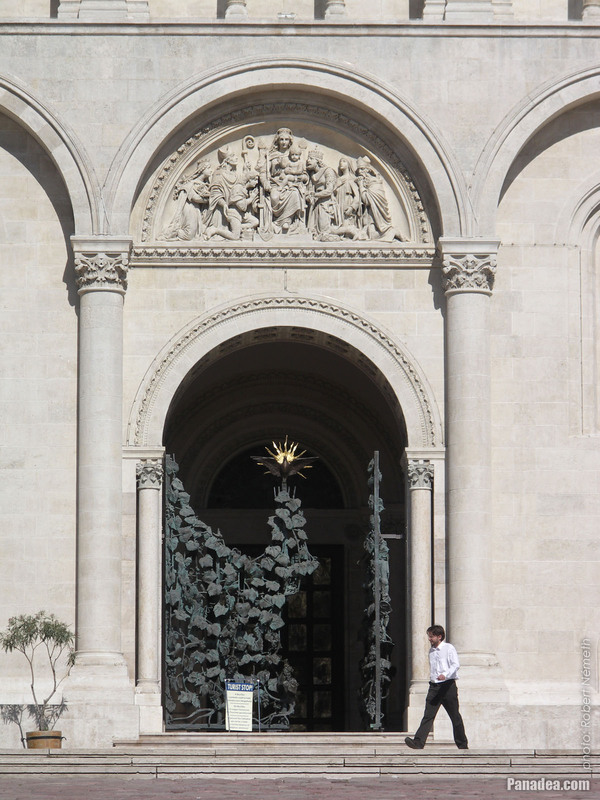 The current relatively modern style apostle statues were created by Károly Antal in 1961.